Now that the 'Eating in ----' series has come to an end, I'm starting a new series on Asian art treasures that I've seen in various museums around the world. 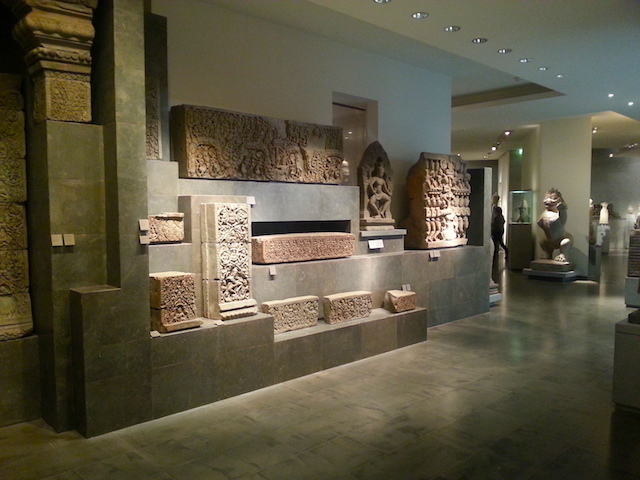 We'll begin with the Musée National des Arts Asiatiques-Guimet, usually just called the Guimet Museum, in Paris. I visited it in late March, 2016. The selection of Angkorean pieces below is not exhaustive. They're just the ones that caught my eye, and that I have decent photographs of. There are in fact several halls filled with Angkorean treasures, for example the one pictured below. The very first thing you see when you enter the museum is a life-sized plaster cast of the peak of the Bayon's central tower. 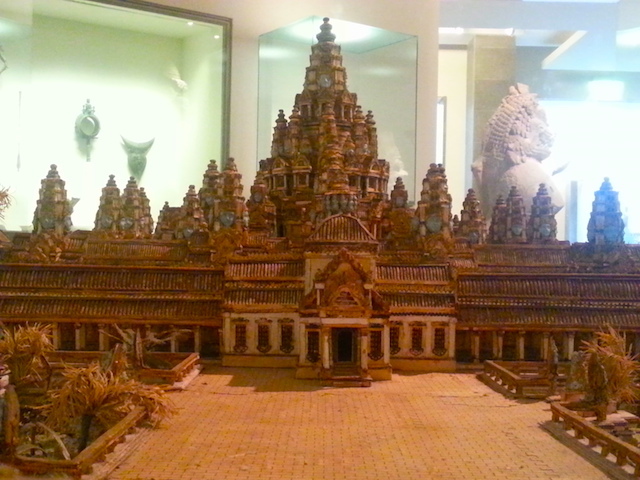 This replica of the top of the great temple in the Angkor historical park, near Siem Reap, Cambodia, looms over the museum's central atrium and can be viewed from more than one floor. To give a better idea of how the Bayon looked when it was new, a scaled-down, colonial-era reconstruction of its presumed original appearance has been slipped in among the genuine Angkorean treasures. It's made of bamboo. If memory serves, it was created for one of the colonial exhibitions that took place from time to time in the late 19th and early 20th centuries in the French capital. It's certainly evocative. The grandeur of the Bayon must have been overwhelming to those who saw it in its original splendour. The Bayon was built by Jayavarman VII, the Angkorean king who reigned from 1191 to around 1218. A great general and administrator, he was also a devout practitioner of Mahayana Buddhism, which he made the state religion. The beautiful sculpture pictured below is of the mature king's head, devoid of any royal insignia. 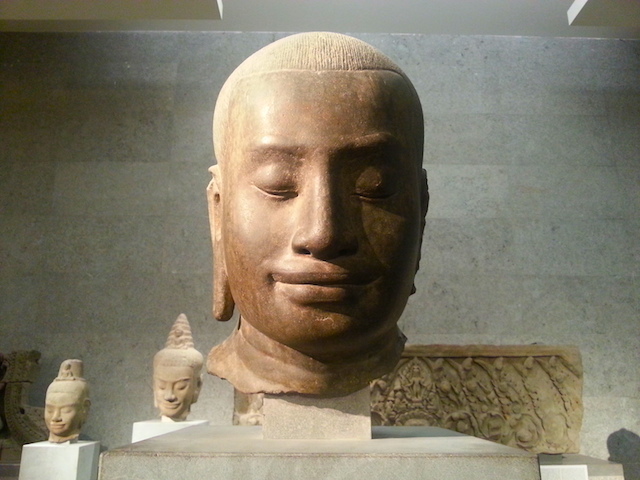 "This sculpture belongs to the Bayon style (late 12th-early 13th century), in which sculptors abandoned the somewhat impersonal, ideal canon of youth and beauty of earlier epochs. They adopted a more naturalistic, earthly, and human style, sensitively modelled, sometimes taking inspiration from the physiognomy of the king or his contemporaries." 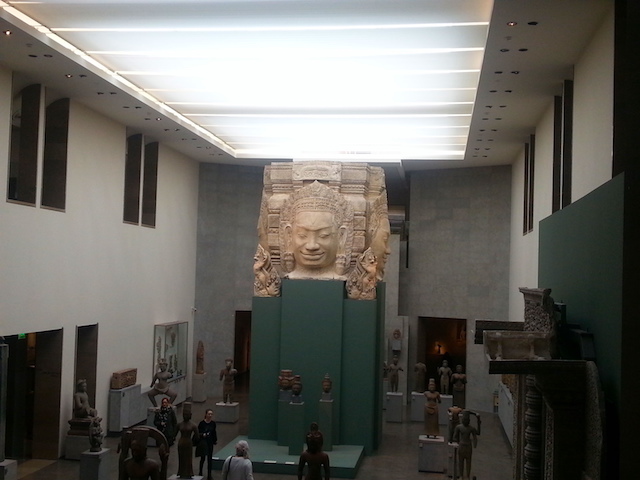 Another sculpture that caught my eye was the horse-headed Vishnu pictured below. I was attracted to it because it seemed so unusual. I'd had no idea that Vishnu was ever represented with a horse's head, so it was with a good deal of surprise that I read the information placard. In part, it reads: "This astounding image of Vishnu Hayagriva -- one of the divinity's hybrid aspects -- belongs to an iconographic series of which there are few other known examples in Khmer art (my translation)." The image comes from Sambor Prei Kuk, a group of pre-Angkorean ruins in the province of Kampong Thom, which is east of Siem Reap and north of Phnom Penh. Dated to the 3rd quarter of the 10th century CE, the image is in the Pre Rup style. 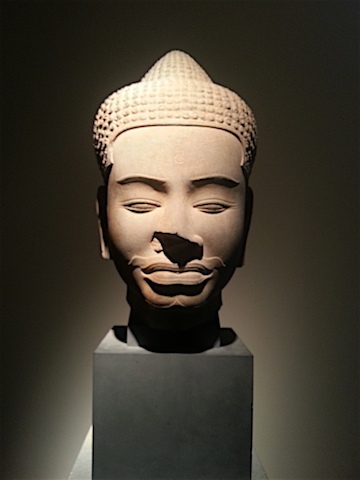 Finally, one of my favourite Angkorean sculptures in the Guimet is an 11th century Buddha head (see below). It's in the Baphuon style. If this photo had a higher definition, I would frame it and put it on my living room wall. Speaking of heads, the image below no longer has one, which is a distressingly common phenomenon when it comes to Angkorean art. Because heads are the most saleable pieces, ruthless looters often just hack them off and leave the rest behind. 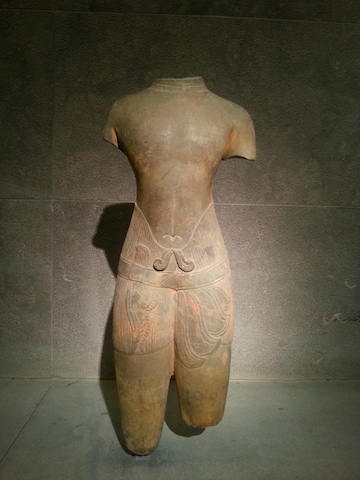 Fortunately, the torso and thighs of this male divinity are beautiful in their own right. The information posted onsite says that the exact provenance of this image is unknown. The curators judge it to be in the Pre Rup style, dating from the 3rd quarter of the 10th century. 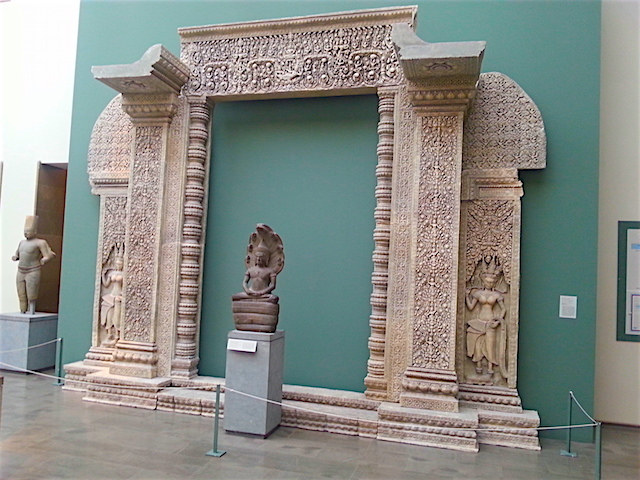 The last Angkorean piece I photographed was an elaborately carved doorway, clearly a temple portal. Unfortunately, I didn't note the related information, nor is there an entry for it in the museum's webpages. I'm going to Paris for Easter, though, so watch this space for an update. 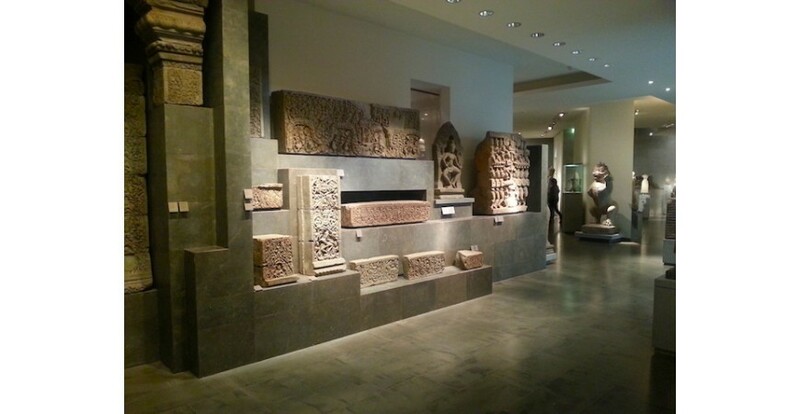 I hope you've enjoyed this little tour of the Angkorean collection at the Guimet Museum. Next up: highlights of the Thai collection! English writer Dame Rose Macaulay meditates on the Bayon. Dame Rose Macaulay's reflections on Angkor Wat in Pleasure of Ruins (1958) are still apt. In 2017, Buddha's Birthday falls today, 3 May, in most of NE Asia. L&P visits Angkor's most photographed and atmospheric temple. L&P inspects a Reclining Buddha at Wat Preah Ang Thom.